1932 Ettore Bugatti Letter + Envelope. This is an original 1932 Ettore Bugatti Molsheim letterhead. This letter was sent on September 20, 1932 to a prospective client in the USA and relays that the London Sales Office has been instructed to forward sales literature in English to the good man. 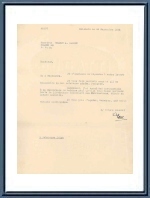 The letter carries the salutation "P/ Ettore Bugatti" which stands for "Pour Ettore Bugatti" or "On behalf of Ettore Bugatti". It has been briefly signed by one of the secretaries. 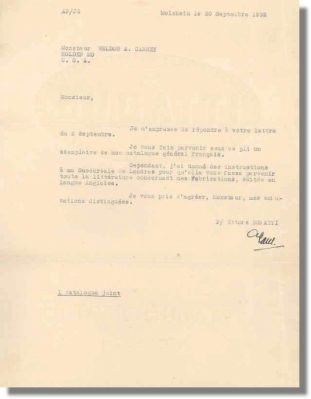 The letter carries a large Bugatti logo as a watermark across the text (sorry, hardly visible in the scan) and a "Ettore Bugatti, Molsheim" watermark at the bottom. It comes complete with the original envelope (a little soiled and damaged) which carries a 1932 Molsheim postmark.